Key to the Union failure at Reams Station is the poor tactical position they assumed around the tracks of the Weldon Railroad. This morning’s piece by Ryan Quint explores the previous exhaustive campaigning experienced by the Second Corps of the Union Army of the Potomac and its impact on their fighting quality at this battle. A brief mental lapse doomed their chances and cost the corps dearly, as a visit to the Civil War Trust preserved section of the battlefield demonstrates. 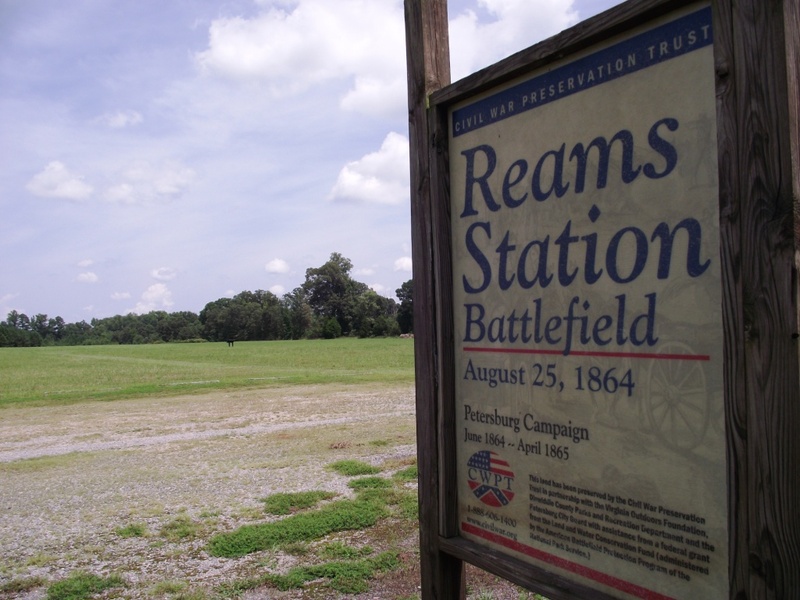 The Second Corps position at Reams Station incorporated earthworks dug by the Sixth Corps in late June while scrambling to the railroad to protect the returning cavalry of the Wilson-Kautz Raid. “They were hurriedly thrown up, badly constructed, and poorly located,” critiqued Lieutenant George K. Dauchy who commanded the 12th Battery, New York Light Artillery. Nevertheless the Second Corps artillerists manhandled their pieces into this position, rather than building a new one from scratch. The cramped space between the brush-covered earthworks on the left and the steep embankment just past the trees on the right is all the room the Second Corps had for maneuver. Having taken the position assigned us, there was nothing to do but enjoy ourselves as we chose, for fatigue duty did not usually pertain to the lot of light artillerymen. A cornfield not far off furnished us a liberal quantity of roasting ears during the day, and some good early apples were brought into camp by the more enterprising foragers. We remember the day as an extremely pleasant one, both in respect of the weather and our enjoyment of the surroundings. It seemed very holiday-like to us as we lounged about the guns. The bedraggled corps should have been making necessary improvements all around their exposed position. “The ground immediately in front of the battery was comparatively clear of large timber, though covered with brush sufficiently high in many places to conceal the movement of the troops,” remembered the diligent Rhode Island sergeant. “To the right and front (northwest) were heavy timber, in which the enemy’s infantry was massed.” But few held belief that the Confederates would contest the expedition along the railroad. “So little expectation had we formed of any severe fighting on this part of the line, that we had not only had not adopted our usual precaution of strengthening our position, but had loaned every pick and spade to a regiment requesting their use, and did nothing whatever to improve our frail breastwork,” claimed Billings. 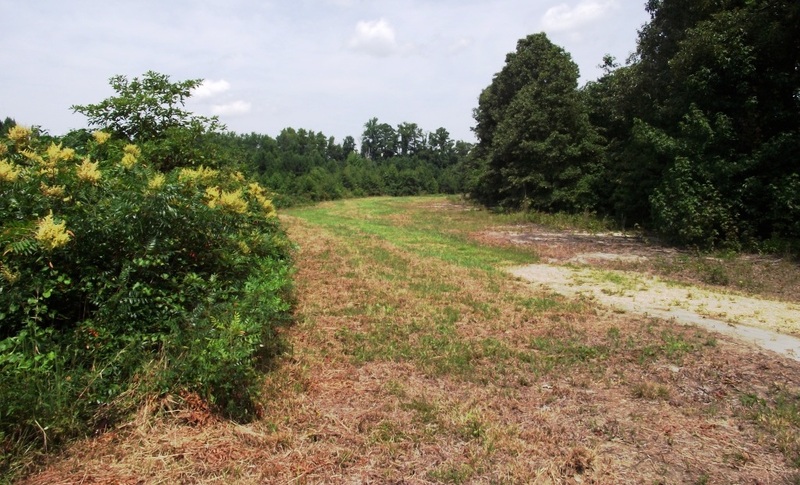 Heavy underbrush helps preserve the remnants of the Union earthworks west of the railroad. Halifax Road, just past the trees, follows the former bed of the Weldon Railroad. 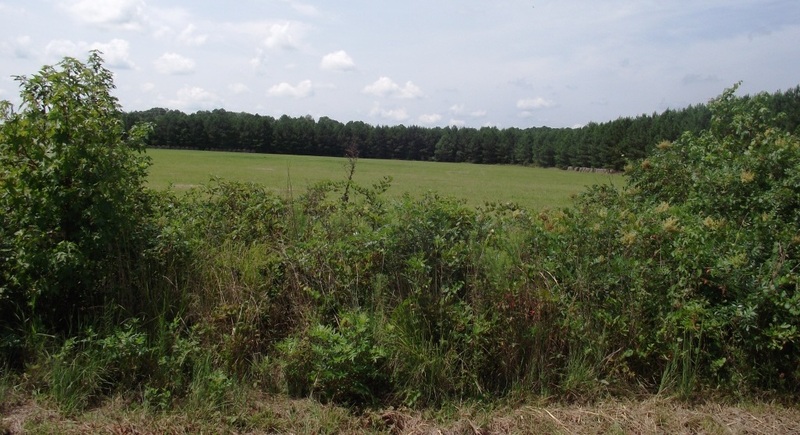 The earthworks did not hold up against repetitively stubborn Confederate assaults, the normally staunch defenders too exhausted and their newly recruited comrades too inexperienced to put up much resistance. With many of its best members lying somewhere between the Rapidan and the James, the Second Corps was not its former self, as described in this morning’s piece. A quick respite on the railroad turned into a frantic struggle to escape. By nightfall nine Second Corps artillery pieces, including several that previously repelled Pickett’s Charge, now lay in enemy hands. 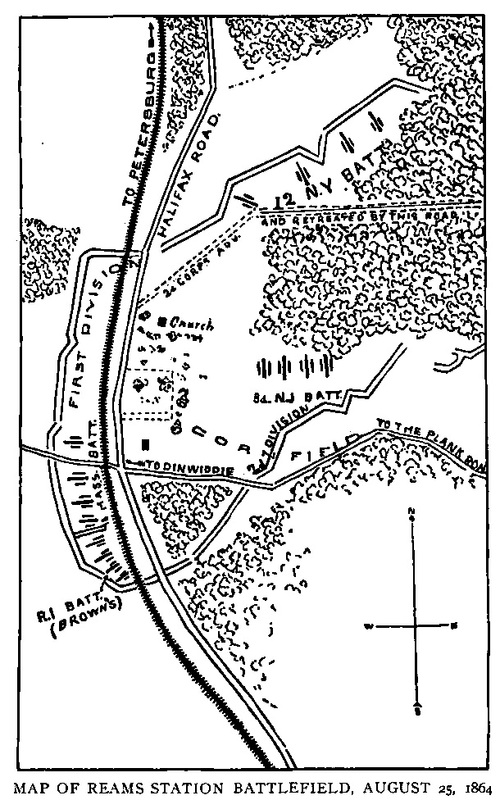 1895 sketch of the Battle of Reams Station from The Story of American Heroism, 1897. 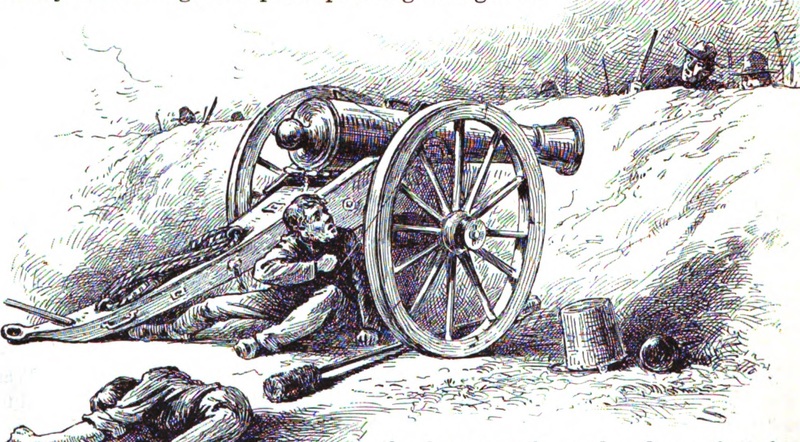 Dauchy, George K. “The Battle of Ream’s Station.” Military Essays and Recollections: Papers Read Before the Commandery of the State of Illinois, Military Order of the Loyal Legion of the United States, Volume 3. Chicago: The Dial Press, 1899, 129-130. Billings, John D. The History of the Tenth Massachusetts Battery of Light Artillery in the War of the Rebellion, 1862-1865. Boston: The Arakelyan Press, 1909, 311. Rhodes, John H. The History of Battery B, First Regiment Rhode Island Light Artillery, in the War to Preserve the Union 1861-1865. Providence: Snow & Farnham, Printers, 1894, 326. Gibbon, John. Personal Recollections of the Civil War. New York: G.P. Putnam’s Sons, 1928, 256. Estherville Daily News, February 7, 1890. This entry was posted in Battlefields & Historic Places, Emerging Civil War, Photography, Sesquicentennial and tagged Civil War Trust, earthworks, Ream's Station, Second Corps, Siege of Petersburg. Bookmark the permalink.